This volume explains how the recent advances in wavelet analysis provide new means for multiresolution analysis and describes its wide array of powerful tools. The book covers variations of the windowed Fourier transform, constructions of special waveforms suitable for specific tasks, the use of redundant representations in reconstruction and enhancement, applications of efficient numerical compression as a tool for fast numerical analysis, and approximation properties of various waveforms in different contexts. Variations of Windowed Fourier Transform and Applications: M. An, A. Brozdzik, I. Gertner, and R. Tolimieri, Weyl-Heisenberg Systems and the Finite Zak Transform. M.J. Bastiaans, Gabors Expansion and the Zak Transform for Continuous-Time and Discrete-Time Signals. W. Schempp, Non-Commutative Affine Geometry and Symbol Calculus: Fourier Transform Magnetic Resonance Imaging and Wavelets. M. Zibulski and Y.Y. Zeevi, The Generalized Gabor Scheme and Its Application In Signal and Image Representation. Construction for Special Waveforms for Specific Tasks: J.S. Byrnes, A Low Complexity Energy Spreading Transform Coder. A. Cohen and N. Dyn, Nonstationary Subdivision Schemes, Multiresolution Analysis, and Wavelet Packets. J. Prestin and K. Selig, Interpolatory and Orthonormal Trigonometric Waves. 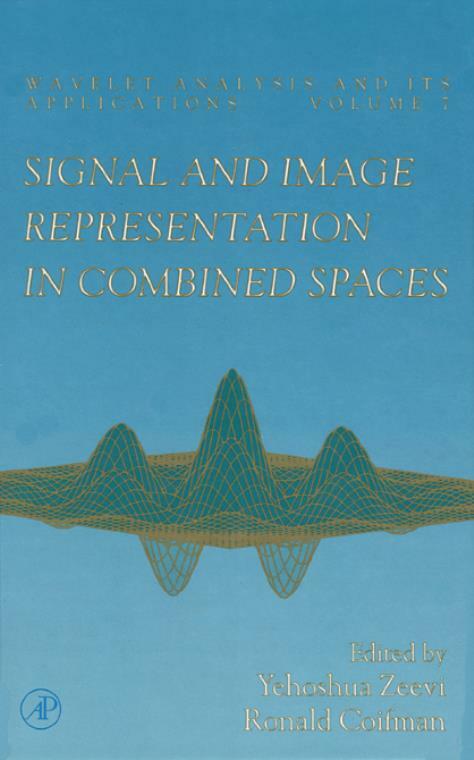 Redundant Waveform Representations for Signal Processing and Image Analysis: J.J. Benedetto, Noise Reduction in Termsof the Theory of Frames. F. Bergeaud and S. Mallat, Matching Pursuit of Images. Z. Cvetkovi( and M. Vetterli, Overcomplete Expansions and Robustness. Numerical Compression and Applications: A. Averbuch, G. Beylkin, R. Coifman, and M.Israeli, Multiscale Inversion of Elliptic Operators. A. Harten, Multiresolution Representation of Cell-Averaged Data: A Promotional Review. Analysis of Waveform Representations: C.K. Chui and C. Li, Characterizations of Smoothness viaFunctional Wavelet Transforms. M.A. Kon and L.A. Raphael, Characterizing Convergence Rates for Multiresolution. B. Rubin, On Calderon's Reproducing Formula. B. Rubin, Continuous Wavelet Transforms on a Sphere. V.A. Zheludev, Periodic Splines, Harmonic Analysis, and Wavelets. Filter Banks and Image Coding: A.J.E.M. Janssen, A Density Theorem for Time-Continuous Filter Banks. V.E. Katsnelson, Sampling and Interpolation for Functions with Multi-Band Spectrum: The Mean Periodic Continuation Method. R. Lenz and J. Svanberg, Group Theoretical Transforms, Statistical Properties of Image Spaces and Image Coding. Subject Index.